3 day training (english) „ISO 15504 for System Engineers“. The training presents ISO 15504 Process Reference Model (PRM), Process Assessment Model (PAM) in details for system engineers (HW/SW embedded systems development). 3 day training (english) „Automotive SPICE® for System Engineers“. The training presents ISO 15504 Process Reference Model (PRM), Process Assessment Model (PAM) in details for system engineers (HW/SW embedded systems development). This 1 day training presents managers the ISO 15504 Process Reference Model (PRM), Process Assessment Model (PAM) relevant for embedded systems development. 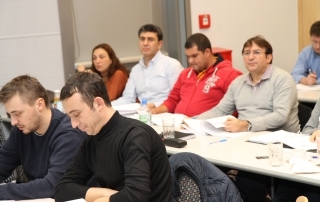 1 day training (english) „Automotive SPICE® for Managers“. The training presents ISO 15504 Process Reference Model (PRM), Process Assessment Model (PAM) in details for system engineers (HW/SW embedded systems development). Agile Tools für Manager. Design Thinking, LEGO®-SERIOUS-PLAY®, Scrum und Kanban.